Taylor Norris and myself will be punching out the minimal beats this Friday @ Big Car Gallery in Fountain Square, Indianapolis. The opening is titled “Negative Into Positive: The Art of Antonio Adams” and will also feature live bands Pravada, Grampall Jookabox and New York based Castanets. Taylor and I will spin from 6-9:30pm, followed by the bands until midnight. 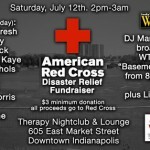 THEN, all day Saturday Therapy Nightclub & Lounge is hosting a benefit for the Red Cross Disaster Relief Fund. The fest is indoors and outdoors, with loads of DJs and live bands. Plus I hear they’ll probably have BBQ and a corn hole tournament.